Children with communication difficulties will lose access to vital technology unless a government decision is reversed, campaigners say. Funding for the Communication Aids Project (CAP) is due to end in March. 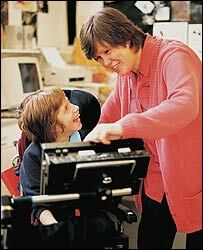 Disability charities say that the devices are essential for a child's development and ability to interact. The government says it is "actively exploring options" to maintain the momentum generated by CAP, and that children's trusts should provide funds. Over the past four years around 4,000 school-age children with communication difficulties have received technology and training from CAP. The project has been funded by the Department for Education and Skills (DfES) and has received a total of £21m. A group of charities - including Scope, the Royal National Institute for Deaf People, the Royal National Institute for the Blind and Mencap - has received the support of almost 100 MPs from all parties who want the funding to continue. CAP was originally intended to supplement funds from schools, local authorities and health authorities. Campaigners say that many more children could benefit from using communications aids in order to allow them to express thoughts, needs and desires. "The importance of communication cannot be underestimated," according to Ruth Scott, Scope's external affairs manager. "CAP has made the difference to the lives of thousands of children...but this is only the tip of the iceberg." Scope wants the current level of funding - £5m a year - to continue along with a commitment to provide a comprehensive service that includes pre-school children and adults. "Without this, government is simply writing off people with communication impairments," said Ms Scott. The charities point to a government report, published a year ago, which stressed the importance of communication for improving a disabled person's quality of life. And the report referred to CAP as a model of good practice. In a motion put before the House of Commons the MPs say that without the technology to help people to communicate, they are unable to express themselves freely, discuss ideas or make choices. "Current statutory provision is a lottery based on age, postcode and impairment type," the motion says. The MPs say there should be a statutory right to augmentative and alternative communication (AAC) equipment. They say that local equipment budgets often will not meet the high cost of assessments, equipment purchase and the on-going training and support that AAC users need. The hardware and software cost around £6,000 plus the price of extras like table and wheelchair mounts, keyguards and spare batteries. The latest devices have wireless network connectivity, can be linked to a mobile phone by Bluetooth and can have integrated DVD players. The DfES has confirmed that funding has come to an end. "We have always made clear that CAP was a supplement to existing provision made locally and this local provision will remain," a spokesperson said. "However, we are keen to maintain the momentum generated by CAP and we are actively exploring options for doing this. "In addition, we will also be looking to children's trusts to provide appropriate support and equipment to all disabled children in their area."